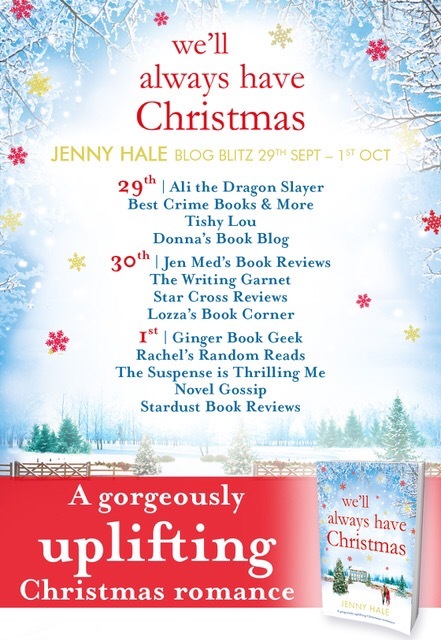 It is my absolute pleasure to be taking part in the blog blitz for We’ll Always Have Christmas by Jenny Hale. I loved reading The Summer House earlier this year so was thrilled when Kim Nash from Bookouture invited me to take part here. And Christmas with cookies – what’s not to love right? I’ll share my thoughts with you in just a moment, as soon as we’ve taken a look at what this book is about. Faced with a pretty bleak Christmas after being made redundant, single mum Noelle is offered the opportunity to work as a carer for a wealthy local gentleman, a man whose house she and her friends used to pass by every day on the way to school. It is something that will suit her until her Grandfather is ready to retire and she can take over her beloved Grandmother’s bakery. Only… things haven’t been going so well, and with rent set to rise, her family announce that they need to close the bakery after Christmas. Not only that but the man responsible is none other than her new boss, Alexander Harrington. Determined to do right by Harrington’s grandfather, and also to find a way to save the bakery, nothing can prepare Noelle for what she will discover when she moves into the imposing mansion with her young son, Lucas. If you are looking for a heart-warming Christmas tale that will have you going aww in all the right places then look no further. Jenny Hale has a real knack for creating the most irresistible of ‘couples who shouldn’t work’ and We’ll Always Have Christmas is another fine example. The chemistry which exists between Noelle and Alex Harrington is palpable, the infatuation on both sides clear from the very first meeting. Of course it doesn’t hurt that Alex is rich and attractive either, not that either of these facts can make up for what he is doing to her family business, the one thing in her life, other than caring for her son, that Noelle was really looking forward to. But it is Alex’s easy way with Lucas, a boy who is very shy and introverted, which really makes Noelle’s, and the reader’s, heart sing. It is a beautiful thing to watch unfold on the page. There is a secondary story within too, one of Alex’s grandfather and his first love, a mystery woman who once stole his heart and is by and large the reason why Alex and his Grandfather no longer get along. This is also a story which will move even the hardest heart, one of love challenged by societal expectations and class boundaries, echoes of which can be found in Alex and Noelle’s story. For just as Mr Harrington and his first love were from completely different backgrounds, so too are Alex and Noelle, adding a layer of doubt and conflict in Noelle’s mind to an otherwise sweet romance. It makes her second guess all of Alex’s intentions, and when she learns something about his plans for the future, all of her fears seem to be coming true. I really did love the character of Noelle. She is so devoted to her family and friends, in particular her young son Lucas, but while she has a heart as large as the state, she is also a tough young woman and not afraid to challenge Alex, something she does quite regularly. Alex occasionally comes across as an enigma – sometimes aloof but so often kind and patient with Lucas that is is no wonder everyone falls in love with him, readers included. And yet he can easily slip into the role of the affected, wealthy young man Noelle suspects him to be. Someone who puts himself first in a bid to escape his problems. He hadn’t planned on meeting Noelle, on her and Lucas uprooting his plans, and Jenny Hale has done a fabulous job of painting a picture of a young man in turmoil, of one who wants to love and be loved but who is scared, and completely unsure of how to begin. I love the family dynamic which runs throughout both halves of the story. On one hand you have Noelle’s family, as close as you like – her Grandfather and her father co-running the bakery which was started by her Gram, and her mother often found looking after young Lucas. Even her relationship with her sister Heidi is almost that of best friends rather than just siblings. And Noelle still has her best friends from childhood, Jo and Phoebe, who are there for every high and every low in her life. It’s such a wonderful scene when they are all together, one that will really make you smile, even in times of adversity, so much so that it makes the stark contrast to Alex’s life all the more prominent. Alex and his grandfather are at loggerheads, disagreeing over everything, and it will take a miracle to bring them together. And who knew that miracles taste like gingerbread? The book has everything you would expect in a true Christmas romance – the heart throb, the conflict, the will they won’t they and the wonderful winter setting which might well chill the toes but ultimately only serves to warm the heart. Truly romantic, full of both entertaining and heart-breaking moments, moments of real poignancy and revelation, this book will tick the boxes of both romantics and Christmas lovers alike. And I’d sure like a list of some of those biscuit and cake recipes as they sound thoroughly lush. A wonderful Christmas feast of a book, full of hope, love and sugar sprinkles. I loved it. Be sure to check out all the other brilliant blogs taking part in the tour as well. Sweet! I’m a sucker for a good Christmas book, Jen, and this might be a perfect choice! Appreciate the review!